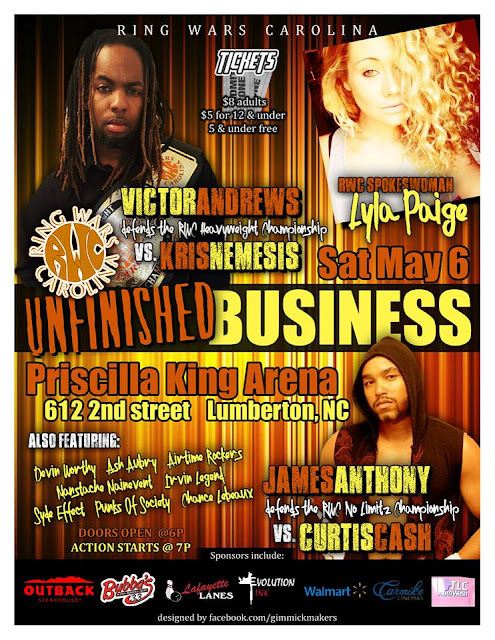 Ring Wars Carolina: Next Event: "UNFINISHED BUSINESS"
A lot of things happen in a short amount of time. Peoples minds and directions seem to get persuaded and off track by false prophets! Sometimes it just seems there are a lot of options when there is really just 1! It's time you'll, Its time to clear the obstacles before you can move a head. It's time to wrap up some "Unfinished Business"! May 6, 2017 in the Home of RWC, The Premiere facility in Lumberton NC, The Priscilla King Arena located at 612 2nd street at 7pm. RWC will present "Unfinished Business"!